Recently, I took the opportunity to retrace the steps of my Scandinavian ancestors, and found some powerful wisdom in the Norwegian culture that produced the majority of my heritage. In Norway, common humanity is of great, perhaps even greatest, worth. The value placed on everyday life, often in the face of great trials, is paramount, and I sensed it as I spoke with the many Norwegians I encountered. From the young Air BNB host and her youthful cooperative, to the new father taking time off from work to tend to his infant, to the proud historians of the Norwegian Resistance Museum and the tour guide who informed us of the loss of almost 50% of the entire population in the late 1800’s with a regret that still felt fresh…all were oriented, in their everyday lives, to the good of the whole. It isn’t that I’m at odds with the U.S.’s general desire for individual greatness. As each of us strives to find our special, even unique voice, some wonderful things come of our inventiveness. But I also do believe there is a cost, in our isolation and loneliness at times, in our deeply felt disappointment when our specialness isn’t recognized and lauded, our entitlements not fulfilled. 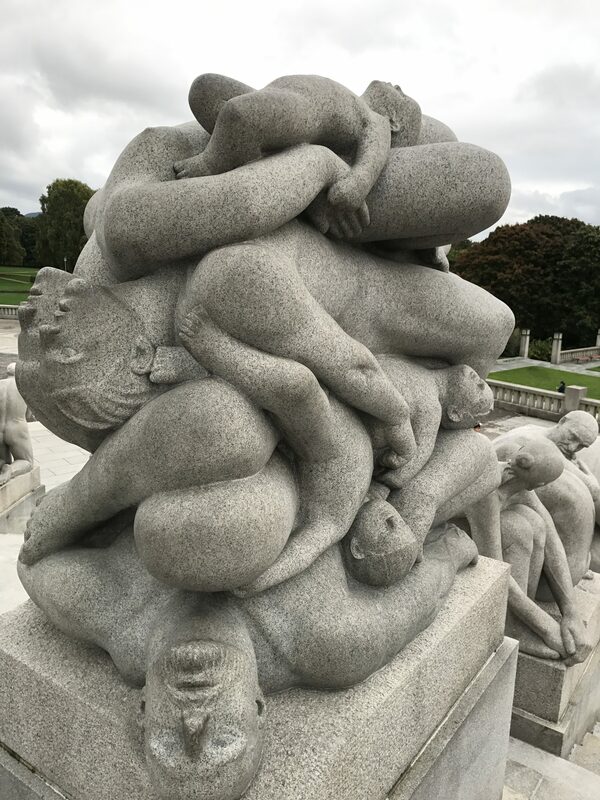 Which is why this sculpture in Frogner Park, in Oslo, by Gustav Vigeland, really resonated with me. Not really sure what the back story is…massacre during WWI? Plague? But some tragedy with a high body count, much like what is happening over here way too often. The faces of the dead now devoid of the humanity that graced them in life. As a therapist, I deal with individual torment, but as a country, as a society, we must also think of trauma as something socially induced and with cultural impact. Regardless of where one stands with gun control (and I doubt that Las Vegas’ tragedy changed not one NRA mind), this country is subtly changed by each new slaughter, becoming more inured, more tolerant… much as my individual clients survived by dissociating, by learning to live without safety, becoming hypervigilent and chronically anxious. By learning not to care. So the question, dear reader, is…is my right to collect and carry semiautomatic weapons worth the loss of a caring society, where humanity is paramount?